1. In a large shallow dish, combine the cider and olive oil. Place Tuna Steaks in the dish and turn a couple of time to coat them in the mixture. Cover the dish with plastic wrap and refrigerate for 20 minutes. 2. In a medium bowl whisk together sour cream, chipotle peppers, basil, and lime zest. Stir in diced apple and season with salt and pepper. 3. Preheat barbeque to moderate high heat 425°-450°F (218°C-232°C). 4. Oil the grill to help prevent sticking. 5. Remove the tuna from the marinade and place on a baking tray. Season the fish with salt and pepper. 6. Place the tuna steaks on the grill and cook for 1-2 minutes per side until nicely charred on the outside and rare in the middle. Remove from grill. 7. Brush the bread slices with olive oil and grill them each for 30 seconds a side until light brown. Remove the bread and rub each slice with a garlic clove scratching the flavour into the bread. 8. 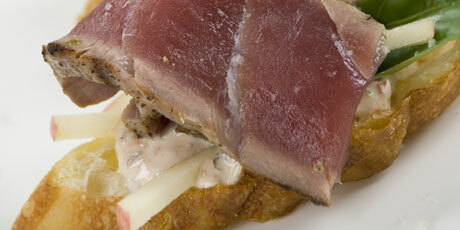 Slice the tuna into thick strips and place one slice on each toast. Serve with a dollop of cream a basil leaf on top.